There has been a sharp spike in volatility in the SERP Trackers indicating a Google Algorithm Update on the 27th of March 2019. Published: Mar 29, 2019. 08:56 UTC. Current: ‘Unnamed’ Update - March 27, 2019. There has a been sharp spike in volatility in the SERP Trackers indicating a Google Algorithm Update on the 27th of March 2019. Unlike previous updates that appear to be rolled out over a number of days, this seems to have been rolled out in just one day. Furthermore, it appears to have targeted all categories equally, rather than specific sectors. As such, I suspect this is unrelated to the March 12 update, and something new. The only point of interest I discovered was a substantial increase in the influence of the top 10 largest websites, such as Wikipedia, Amazon, Facebook, etc. I’ll talk a little about this later. The SERP Trackers show increased volatility between the 20th and 23rd of March, with a spike on the 22nd. The scale of the update seems much less than the 12th March Update. The SEMrush Sensor shows the spike in volatility on the 27th of March. SEMrush Sensor 27th of March 2019 in the US. © SEMrush. The Rank Risk Index tracker shows the spike in volatility on the 27th of March, but not quite to the same scale as the SEMrush Sensor. Rank Ranger Risk Index 27th of March 2019. © Rank Ranger. The MozCast weather report shows increased volatility on the 26th of March. Mozcast 26th of March 2019. © Moz. The Algoroo report again shows volatility on the 27th of March. Algoroo 27th of March 2019. © Algaroo. The SERPMetrics report shows some minor volatility on the 27th of March, but far lower than the other SERP trackers. SERPMetrics 27th of March 2019. © SERPMetrics. SEMrush Sensor Deviation of Categories 27th of March 2019. © SEMrush. I’m honestly at a loss as what to suggest here. The update appears to affect all categories on just one day, and as such, it is unlike all the other updates there have been during February and March. Having looked at Mozcast’s Daily Big 10, I do see that the volatility coincided with the top 10 websites on the internet seeing some significant gains. I suspect this may have skewed the volatility charts a little. 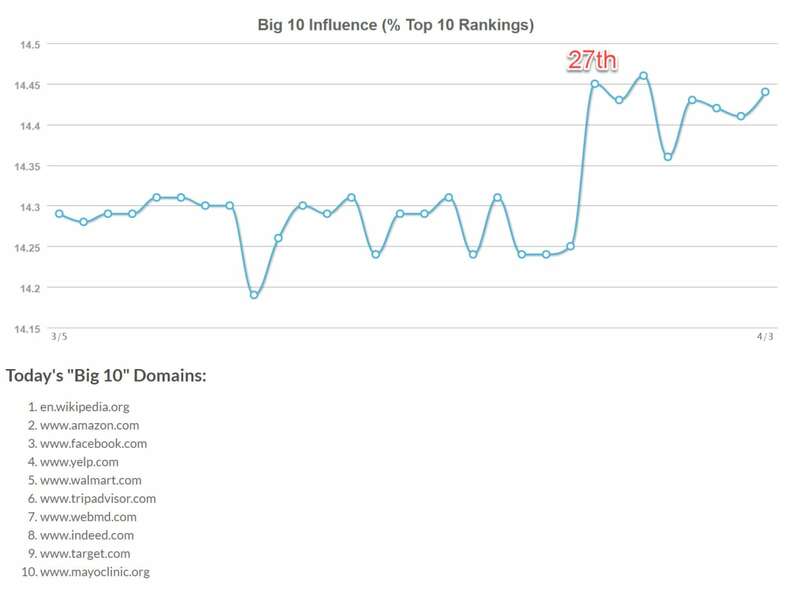 Big 10 Influence tracks the percentage of page one results held by the top 10 sub-domains. © Moz. Let’s take a look at the discussions on WebmasterWorld for this update. What is interesting, is that many webmasters are reporting traffic drops around the 30th of March, a few days after this spike in volatility, even though the SERP trackers are relatively quiet.